In conjunction with the national reading festival by NoPassport, in collaboration with Dominic D'Andrea (Producing Artistic Director, The One-Minute Play Festival, #1MPF), and locally with the Philadelphia New Play Initiative and the Directors Gathering, Plays & Players, Power Street Theater Company, and Tamanya Garza are proud to announce 30/30/1, a celebration of new plays by US Latina/o playwrights. 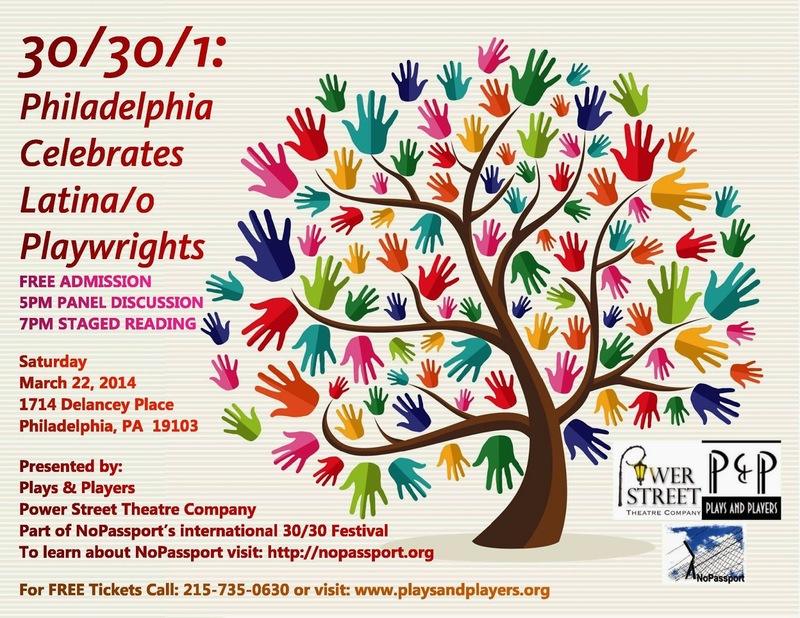 30/30 is a gathering of 30+ NoPassport playwrights and theatre-makers who also happen to be US Latina/o artists. Each playwright asked to participate has selected one play from their body of work to make part of this scheme. Some are brand new plays. Others are from the author's hidden back catalogue. Others are representative pieces. Some are two handers, others are multi-character pieces. The range is vast and wide, as rich as US Latino theatre writing itself. The plays will be presented as readings in venues both inside and outside of the theatre in cities all over the world over the course of the next three months. To reserve a free ticket for the panel conversation and public reading, please go to www.playsandplayers.org or call 215-735-0630. If you have some planes for upcoming events in Hollywood then share it here. People love to check starsofworld.com which provides all important stuff related to celebs, their upcoming events at their home town.